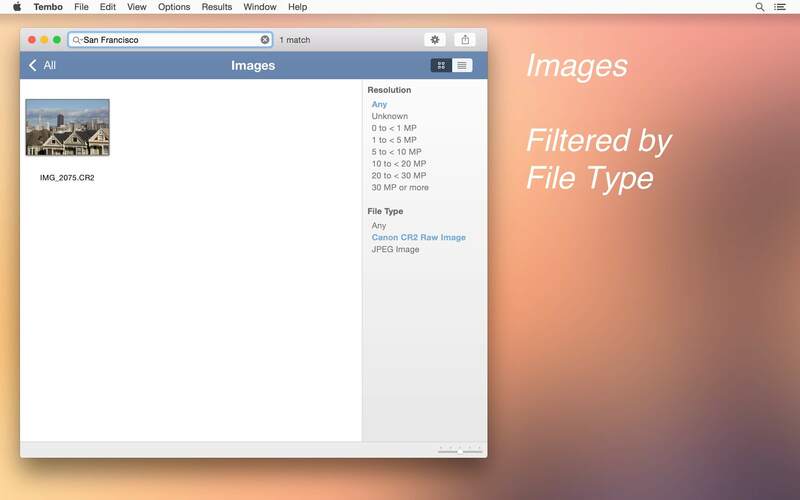 Tembo is a super-efficient, organized file search tool. It will get to your files as quickly as possible. Tembo finds documents, folders, mail messages, PDF files, images, videos, and more. Search starts with a single text entry. 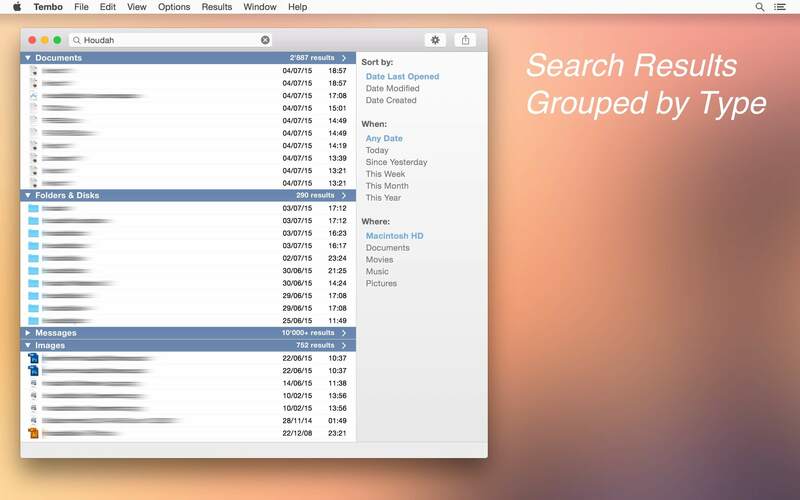 Tembo then groups search results by file type category. For each group, Tembo first shows the top 10 matches. Often enough, you will find the sought for file right here. Drill-down into groups to see up to 10'000 results. The real power of Tembo is revealed when you drill down into a group. Filters appropriate to the current group help you quickly find what you are looking for. Filters show options that are actually available. The File Type filter, for example, shows a Microsoft Word option only if the search returned Word files. Select that option to reduce the long list of results to just Word files. 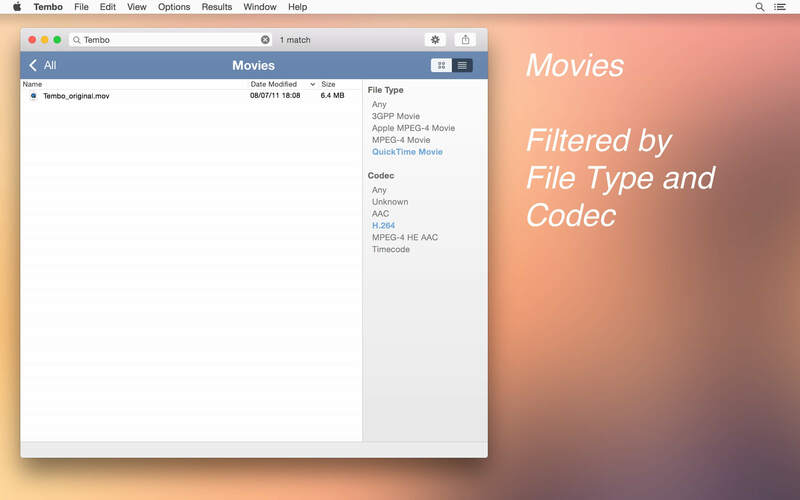 Command-click several filter values to see files of different types. 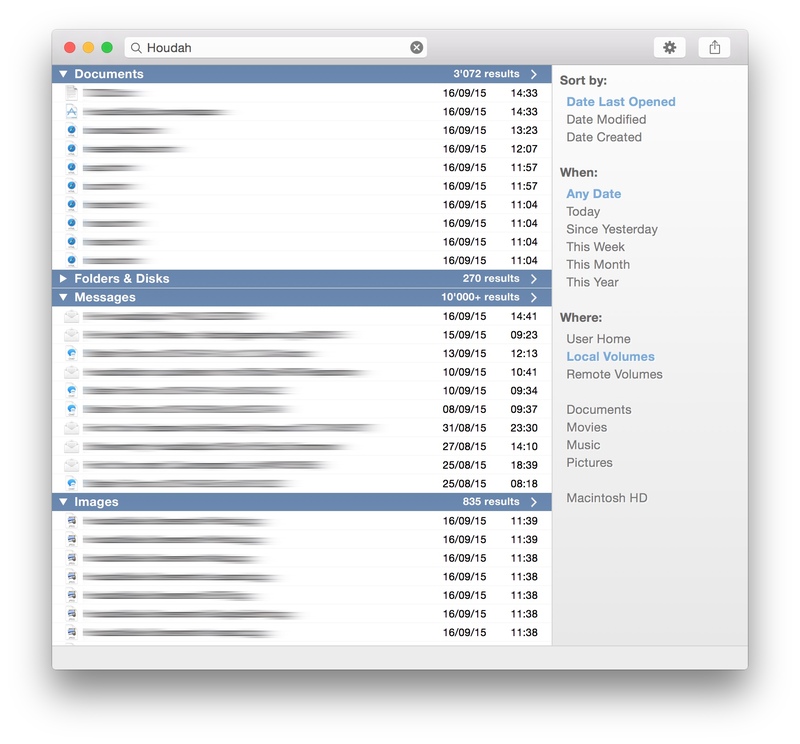 For detailed searches, boolean operators, search templates and more, check out HoudahSpot: Powerful File Search for Mac. 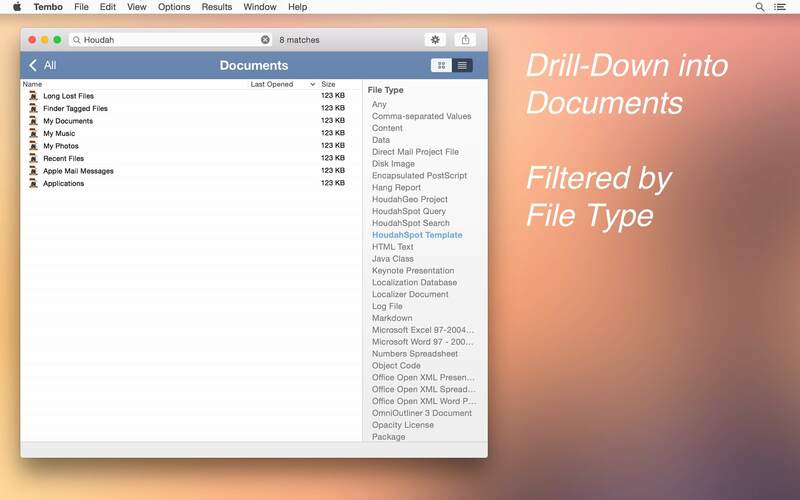 Speed up your file searches! Tembo 2 requires Mac OS X 10.10 or later. 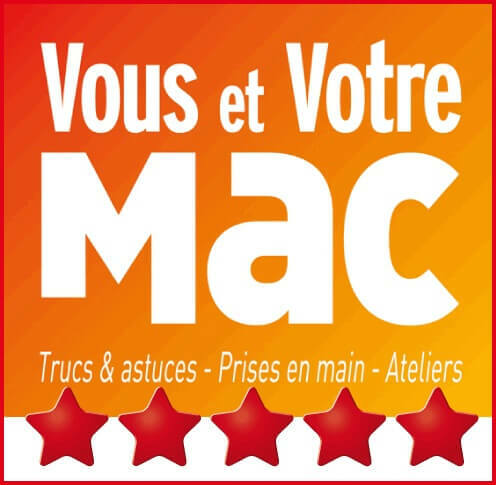 It is fully compatible with macOS 10.14 Mojave. Share files using Mail, Messages, Facebook, etc. 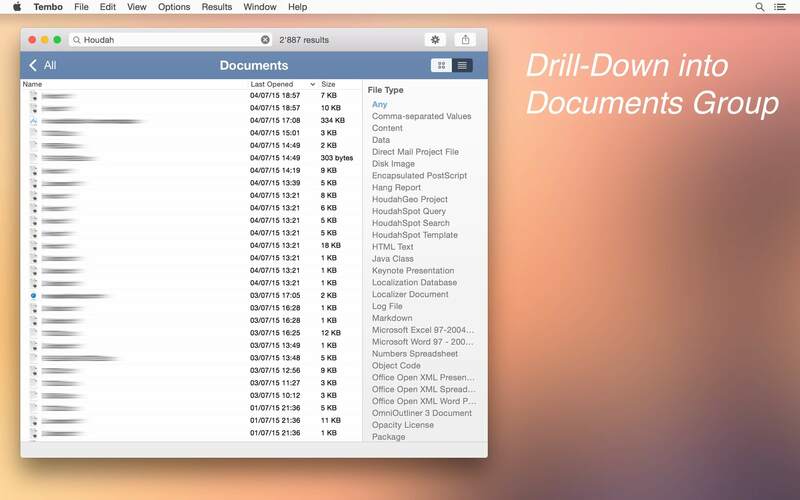 Tembo uses the existing Spotlight index to get you to your files in no time. 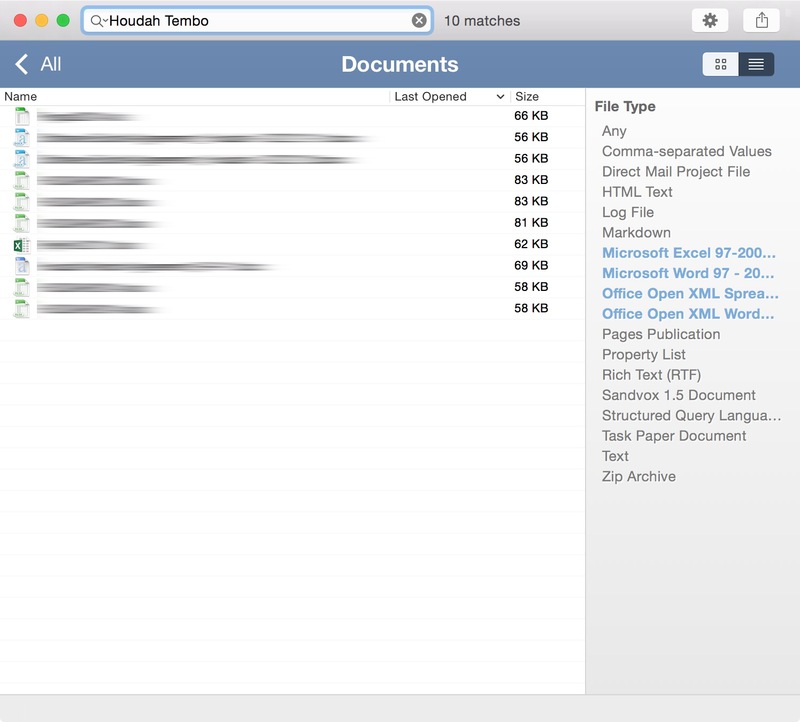 Tembo can find any file indexed by Spotlight. This includes files in the Library folders, but excludes most system files, hidden files, etc. There are two versions of Tembo: Mac App Store and direct download. The version available on the App Store is confined to the macOS application sandbox. The sandbox requires Tembo to ask for explicit permission before it can access files or folders. It also restricts interactions between applications. Thus, some features are available in the direct download version of Tembo only.